Companies are increasingly awash with numerous types of customer data from various sources. These data can provide insights giving brands the competitive edge to win, serve, and retain customers in a time when individuals have more information and choices available to them anytime, anywhere. But leveraging customer data isn’t an exact science. As consumers start to scrutinize the data that’s collected about them, including by whom it was collected and for what purpose, extracting value from this data without alienating customers is easier said than done. In July 2014, Neustar commissioned Forrester Consulting to evaluate the growing tension between increasing consumer skepticism around data collection and use, and the established methods of capturing and applying customer data for marketing purposes. To further explore this trend, Forrester developed a hypothesis to test how much of a consumer’s relationship with a brand is based on trust, and how much of that relationship is predicated on whether brands have earned that trust in ways that extend beyond the basic ability to competently deliver goods and services. In conducting an in-depth survey of 998 online consumers in the United States, Forrester found that businesses that exemplify integrity (defined as the commitment to transparent and honest business practices) in addition to competency (their ability to deliver goods and services in a way that meets customer expectations) are those that earn consumer trust. Furthermore, Forrester found that when it comes to customer data use, companies that fail to assess the appropriateness of different types of data in different contexts are particularly vulnerable to losing consumer trust. Consumers are increasingly protective of their data. More than half of survey respondents reported having declined providing information to companies because they were wary of it being sold to a third party. Additionally, nearly half use at least one tool to protect their personal information online, with younger generations showing significantly higher rates of adoption of such tools. Competence alone doesn’t earn consumer trust. Companies must be competent at delivering goods and services in order to have a viable market presence, but they can’t build trusted, sustainable, and beneficial relationships with their customers on this basis alone. In addition, online consumers seek companies that have integrity in their business practices. What’s more, companies that exemplify competence but lack integrity do not earn customer trust. Customers value businesses that put a premium on integrity. While consumers continue to be motivated most by competitive pricing and the quality of goods and services, a company’s perceived integrity also ranks in the top three factors in the buying decision. In fact, survey respondents ranked integrity as a more important consideration than aspects like customer service, loyalty programs, and recommendations from family and friends — all of which receive arguably more attention from today’s marketers. There’s no one-size-fits-all approach to using consumer data with integrity. 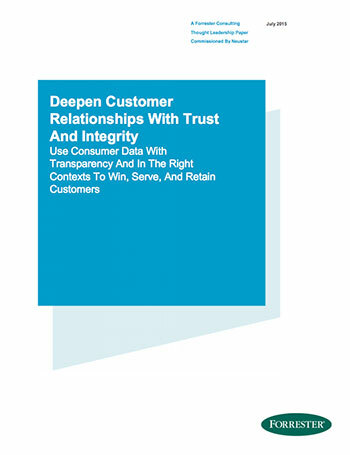 What constitutes a respectful, valuable, and prudent use of customer data — without pushing the envelope to a point at which consumers lose trust — is contingent on contexts such as industry or customer demographics. Choosing what type of data to capture, when and how to use it, and who to share it with is a critical decision that can’t be taken lightly. This research is a follow-up to an earlier Thought Leadership Paper produced by Forrester Consulting on behalf of Neustar entitled, “Differentiate With Privacy-Led Marketing Practices,” which was published in July 2013. Everyday life is increasingly online. Your customers are increasingly online anytime and anywhere — and they’re always addressable.1 In 2013, 71% of the online consumers we surveyed owned smartphones and 37% owned tablets. In 2014, those figures rose to 80% and 50%, respectively.2 The average rate at which survey respondents visit any given website category on at least a monthly basis currently stands at 44%, up from 39% in 2013. Thirteen of the fourteen categories surveyed saw an increase in monthly visitors, with no respondents indicating they visit no category. Shopping websites, which retained the No. 1 spot in 2014, saw one of the biggest increases in monthly patronage, jumping from 68% to 78% of the online population in just one year. Consumers are conducting more transactions online. When we dig into the details of how online consumers shop online, we see some even more impressive trends. In 2013, 52% of respondents reported conducting ten or fewer online transactions within the preceding twelve months. In 2014, that figure fell to 39%. Viewed from another perspective, 24% of 2013 respondents reported conducting over twenty online transactions in the same time period, while 37% indicated the same in 2014. Corporate consumer data practices are not a secret to your customers. Given the recent media and legislative spotlights being shone on consumer privacy laws and data breach incidents, it’s not surprising that a significant majority of consumers are aware of the types of data companies collect and how they are used. 85% of survey respondents claimed awareness of the practice of buying third-party consumer data beyond what they collect directly, and 87% know that such data is used to target offers and advertising relevant to them. Online consumers are taking steps to protect their privacy. In light of the rates at which consumers are conducting their lives online, the amount of shopping they conduct virtually, and their awareness of how their data is collected and applied, it may appear that they are comfortable with this dynamic. However, our survey data suggests otherwise. 54% of 2014 survey respondents reported that they have declined to provide information that they felt may be sold to someone else. Perhaps even more notable, consumers are generally more aware of the information they provide — 13% of 2013 survey respondents said they didn’t know or couldn’t remember if they had declined to provide such information, a figure that declined to 7% in 2014. Similarly, 25% of 2013 respondents said they didn’t know if they used any web browser privacy tools, but that group’s numbers fell by almost half, to 13%, in 2014. What’s more interesting is that while use of these tools increased across every age group, younger generations showed by far the largest jumps. The percentage of 25- to 29-year-olds using at least one tool, for example, grew from 42% to 73%. Complete trust of companies is rare. When we asked online consumers to rate their level of trust of several types of businesses, we found them to be extraordinarily averse to giving a ranking of “completely trust.” In fact, an average of only 25% of respondents indicated such confidence across ten business categories, with a dismal peak of 37% for a large online retailer. That said, we were fascinated to see that trust is highly correlated to the perception of customer experience, as measured by Forrester’s Customer Experience Index (CX Index™). Companies need both competency and integrity to earn consumer trust. While relatively few respondents completely trust the companies they do business with, we went deeper to understand those more trusting individuals to get a sense of what drives their sentiments. In this analysis, we found that the perception of both integrity and competence is necessary to gain the trust of the largest group of respondents. An average of 47% of respondents in this profile indicated that both integrity and competence contributed to their trust level, while only 32% and 14%, respectively, said the same for competency or integrity alone. In other words, if you’re good at delivering your product or service but aren’t honest with your customers, or vice versa, you risk alienating the majority of your market. Foregoing integrity diminishes consumer trust. While integrity and competence are equally important for gaining trust, losing trust is much easier. When we studied respondents who indicated a distrust of various industries, we found that the most influential factor is a perceived lack of integrity in business practices. How companies protect and use personally identifiable information (PII) is core to a business’ perceived integrity. When we asked survey respondents about their likelihood to continue purchasing products from a company if they discovered it had sold their PII, a whopping 54% said they were either very or somewhat unlikely to keep shopping with that business. What’s more, younger consumers (18- to 24-year-olds) are the most likely to turn their backs on companies that sell their data. Thirty-two percent of this cohort said they would be very unlikely to shop at such stores again, more than any other age group. Consumers have a clear sense of what they define as integrity. We asked survey respondents to provide two or three words they associated with businesses with competence, as well as words they associated with businesses with integrity. The results, when visualized in a word map that scales answers to their number of mentions, paint distinct pictures of how consumers perceive the two concepts. The glut of words associated with “competence” shows the nebulous definition consumers associate with the term. When it comes to “integrity”, however, the picture is much clearer — respondents overwhelmingly associated the term with “honesty,” “trust,” and “transparency”. This consensus shows not just an understanding of the term, but the importance of the concept when it comes to who they shop with. Integrity is a key competitive differentiator. Any business leader can tell you that price and quality are the two most important consumer decision drivers, and our research supports this fact. But in the age of the customer, firms have a very real opportunity to differentiate themselves from the competition on a different level. Online consumers see integrity as a critical differentiator, ranking it third behind price and quality and ahead of heavily capitalized considerations such as customer service, convenience, competency, and loyalty programs. Furthermore, those who factor business integrity into their decision-making tend to feel more strongly about it than do those who factor in competency. Over 50% more respondents rated integrity as their No. 1 factor than they did competency. Firms should use context to determine whether behavioral or inferred data is most appropriate. Respondents who were shown the scenario of a healthcare company applying inferred data to calculate a policy quote weren’t too keen on the concept — 41% indicated they would lose trust in a company with this practice, compared with only 19% who said the same for a company that uses behavioral data to calculate a quote. This stands in sharp contrast to a less sensitive retail scenario, where 82% and 91% of consumer trust would be increased or unaffected by inferred and behavioral data use, respectively. Inappropriate data use cases pose serious threats to businesses. When customers catch wind of companies using their data in ways they don’t like, they vote with their wallets. 43% of respondents who viewed the inferred healthcare scenario said they would be unlikely to purchase from that company again, versus only 27% of respondents who saw the behavioral healthcare scenario. The opposite is true when it comes to the telecom industry, however. 33% of those who viewed the behavioral telecom scenario were likely to abandon the company, whereas a lower 27% would do the same for the inferred scenario. An individual’s demographics are strong predictors of their reactions to data use. When we examine responses aggregated across all scenarios, a clear inverse relationship between age and willingness to share data emerges. The older your customer, the more averse they are when asked, “How likely are you to share additional personal information for this company to send you targeted marketing if it asked you to do so?” (see Figure 9). Companies must not take this as a license to collect and use Millennials’ data without care, however. The key word in this question is “asked,” and as we’ve seen before, younger generations take more steps than any other to protect data. Using the right data can reap rewards. In the right context, consumers see the value in sharing their data. In response to our behavioral retail scenario, 60% of respondents reported that they would be likely to purchase from that company in the future, whereas 41% said the same of an inferred retail scenario. 1. Forrester defines the “always addressable customer” as someone who owns and personally uses at least three connected devices, accesses the Internet multiple times per day, and goes online from multiple physical locations, at least one of which is “on the go.” Source: “The Always Addressable Customer,” Forrester Research, Inc., September 26, 2012. 2 Retail sales metrics reflect the increasingly mobile consumer population. In 2014, online retailers reported average growth for sales via tablets and smartphones at 86% and 113%, respectively, over the previous year, compared with an average eCommerce growth rate of 29%. Source: “The State Of Retailing Online: Key Metrics And Initiatives 2014,” Forrester Research, Inc., February 12, 2014.